The Eagle PC was produced by Eagle Computers, Inc. of Los Gatos, California, USA in the years 1982-84(?) and was quite possibly the second company (after Columbia Data Products) to produce a compatible clone of the IBM PC 5150 which had been announced in the Summer of 1981. The Eagle PC could boot IBM PC-DOS floppies and run software designed for the IBM PC. Our Eagle PC has 128k RAM and two 320l 5"1/4 disk-drives and features high resolution graphics (752 by 352 over the IBM's standard 320 by 200). This system features an Intel 8088 and a very solid case design with a "stowage area" under the CPU that the keyboard fits neatly into. Later models of the Eagle supported hard disks and included a portable model called the Spirit. Thanks Dave McDougall at the Weird Stuff Warehouse for this system! 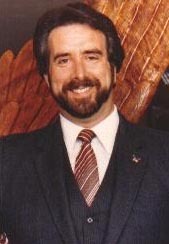 Dennis Ray Barnhart, founder of Eagle Computers, Inc. The demise of Eagle Computers, Inc., the story goes, came when on the day Eagle went public, the founder of the company, Dennis Barnhart, was driving his recently purchased sports car (a Ferrari) on California highway 17 and ended up in the Lexington Reservoir above the town of Los Gatos, killing himself and his passenger. Eagle did not survive this event as the stock price plummeted. Eagle was another example of the "high flying" early 80s in the PC industry when so many companies were being driven to extinction by the powerhouse of IBM and its PC. About the time Eagle was getting going another company was formed in meeting at a House of Pies restaurant in Houston Texas: Compaq. Compaq went on to create a fully legal 100% compatible clone of the IBM PC in a nice luggable package. Compaq took on IBM successfully and occupied the niche that Eagle possibly might have. I just wanted... to let you know that the passenger wasn't killed. It was in June of 1983, he was not speeding (as later determined-even though there is to this day questions about who was driving!) and the demise of the company came years later- in 1986 it "folded its wings" True that his death had a profound effect on the company as he was much of the driving force that led the team -many of them had followed him/and or his career for years before joining up with him-they were all like family and many still are. June 8th, 1983, the day of the accident and the day of the opening/first public stock offering the company actually stopped trade on the stocks for fear of them plummeting. They re-opened during the following day or days and the stock did regain for quite some time and it seemed as though it would thrive. There is even a webpage selling a stock (bond?) certificate for $250 currently from Eagle. Ultimately the loss of the founder and IBM clone wars took their toll without the genius of the man behind it to back it. Curator: Thanks for clearing this one up for the record books! Hi. I just read through your very interesting web site re: dinosaur computers. You have listed the EAGLE PC and related info. 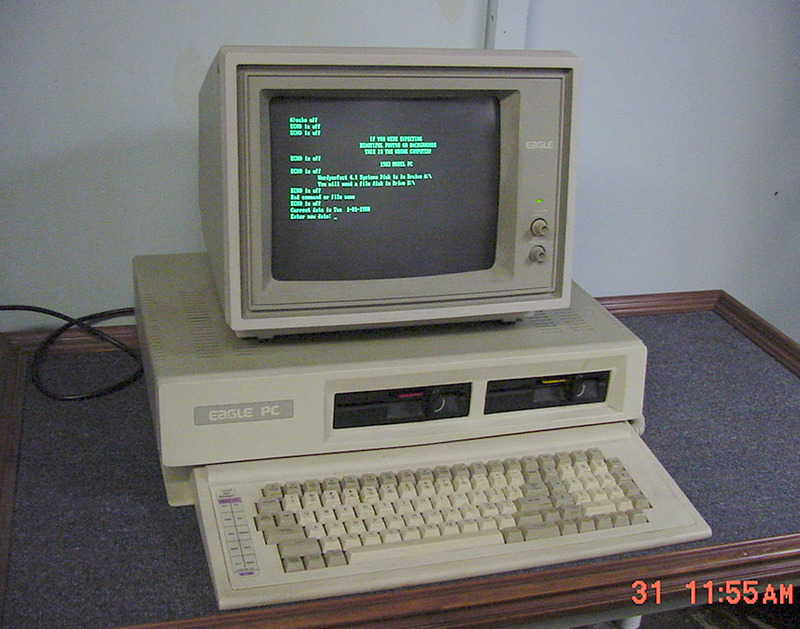 However, I have the original EAGLE II (CPM/Basic) computer, which is not IBM compatible. 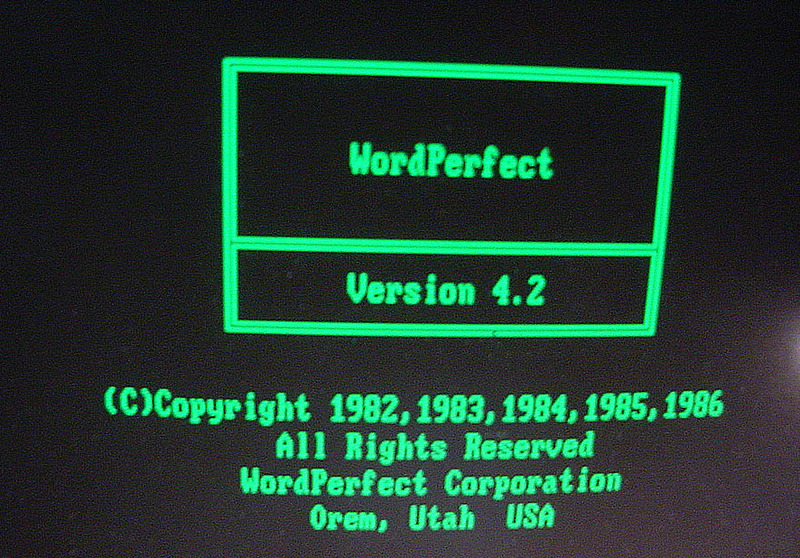 As a poet, I used it only for word processing, however it could be programmed if one were so inclined. Along with it, I used a Diablo 630 printer. The pair cost over $5,000! Amazingly, they both still work beautifully!! In 1999, because the Diablo print wheels are impossible to find, I purchased a DELL laptop. Sadly, it tanked after 13 months! I then bought an IBM, which tanked after 8 months. I finally purchased a DELL desktop with a 4 year warranty. So far, so good. I live only a few miles from Los Gatos where the EAGLE CO. was located, and learned of the founder's death immediately. I have to say that he built one great computer. Talk about a lifetime of use. I used the EAGLE for 16 years, and the poems I wrote on it are published in literary magazines, etc. It still sits, connected to the Diablo, on one side of my office, and I still use it to download some of my older poems. I purchased an Eagle PC 2 in 1983. At the time, it was quite a bargain - I was able to get 128K, 2 floppies, mono monitor, EagleCalc & EagleWriter SW and a Star 10X dot matrix printer for $4K out the door, which was approximately $1000 less than a comparably equiped IBM PC. It even had half-height floppies! I later filled-in the available RAM slots to fully populate the motherboard. The most frustrating thing about the Eagle was that since it did not come with a CGA card, it could not run most IBM PC games. It was also not compatible with the later "Hercules Cards" for mono graphics. Expanability was the weak point of compatibility - many standard PC expansion cards would not work in the Eagle. Several years later I found an Eagle color card, and I could finally run Flight Simulator on a separate mono CGA monitor. 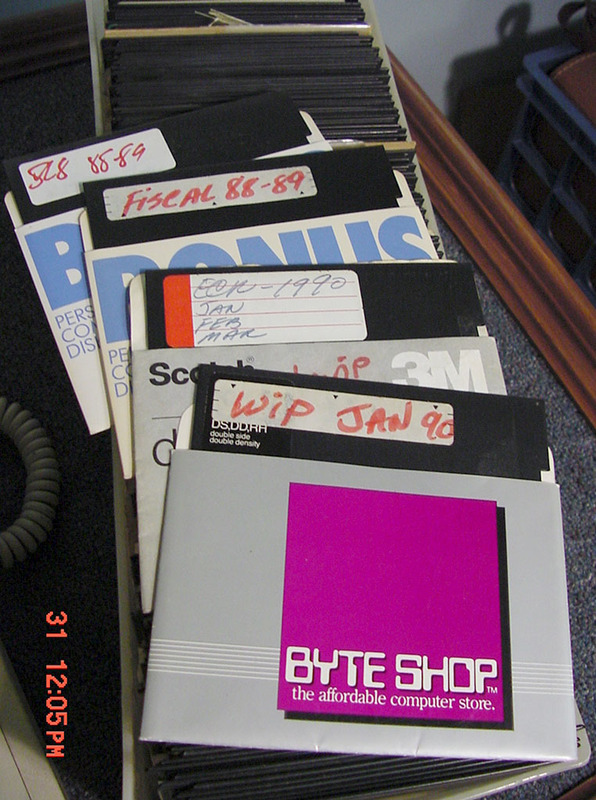 GW-Basic was great, and EagleWriter & EagleCalc were decent programs - not up to WordStar & Lotus standards, but they were good enough for me to complete my senior project in Aeronautical Engineering in 1984. The inclusion of CPM-86 and the P-Code interpreter were interesting toys to play with, but you really couldn't do anything with them. Man, that Eagle was a tank! I used it until around 1989, then gave it to a nephew who used it for several additional years. It was still working when it was then sent into garage sale heaven sometime in the mid 90's. By the way, when I bought my Eagle there was also an Eagle model that had an 8086 processor for "True 16-bit computing". 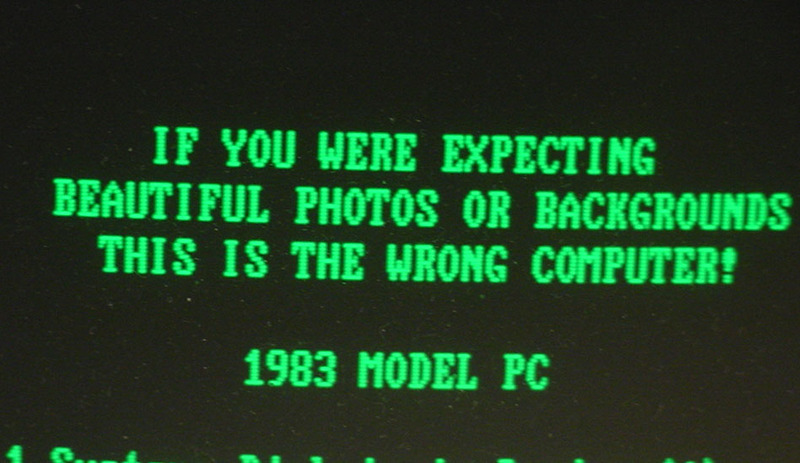 However, unlike the Eagle PC, it would not boot PC-DOS. I think it was called the Eagle 16 or something like that. Your question - "Know anymore about Eagle PC's?" can best be reversed in this case - what would you like to know? I have two of them, purchased new in I believe early 1983. Both were used in my photography business for years ...and both are still in good operating condition or were the last time I fired them up a few months ago! I wrote a few programs in basic for sorting our several thousand High School Senior accounts that saved us hours and hours of labor costs - and in addition, I put togeather a bookkeeping system with the macros in Lotus 123 back then that I'm still using in my business today. 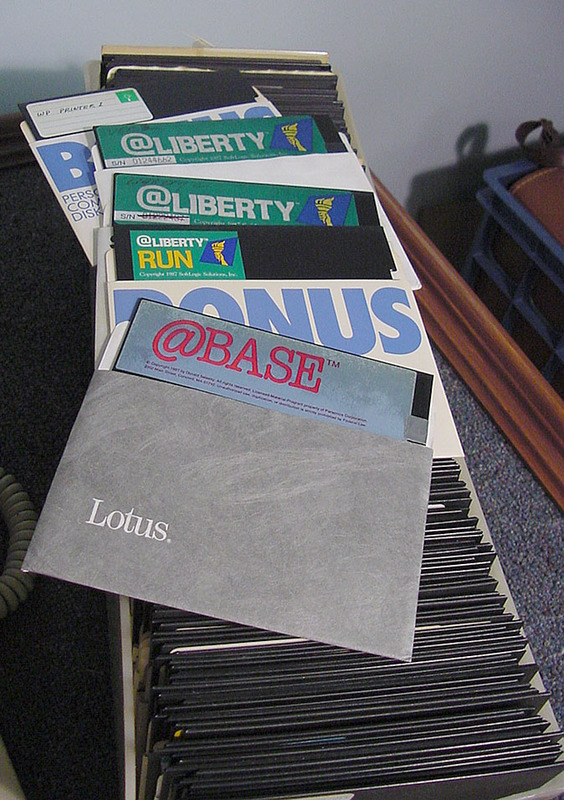 (believe it or not the macros actually converted in the later releases of Lotus) These were not ordinary machines ...the array of function keys and keyboard are still unequaled! I'm 75 now and in photo conservation work and keep them only because as a photo historian and conservor, I can't seem to part with anything but I suppose at least one of them should be in a museum somewhere. I'll send some photos if you want them and if I look around, I may even have some of the original documentation that you may want if you do not already have all of it. Let me know. Pics attached are of the "big" one of the two I have Bruce - I think 512K Memory! Both were in use almost on a daily basis until 1991 are still in great condition. 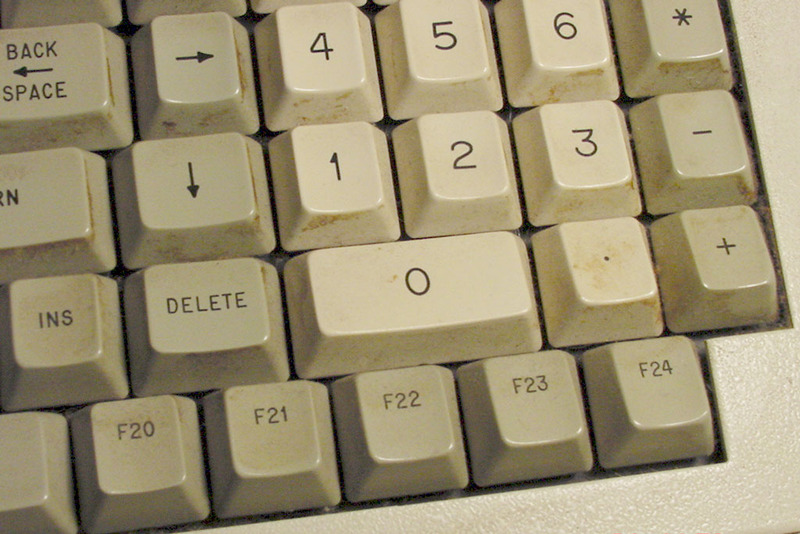 I didn't see any mention of the 24 function keys in your Eagle write-up -- that's what prompted me to write to you in the first place -- a truly great keyboard configuration never picked up by any other company as far as I know. Curator: thanks for the great story and pictures Jim! All of the answers regarding the demise of Eagle computer are flat out wrong. The real reason was an IBM lawsuit that halted production -- Unlike Compaq, Eagle copied (stole) IBM's copyrighted ROM-BIOS. Compaq simply reverse-engineered it. Eagle made a lot of interesting machines, my favorite was a unique 80186 machine that ran rings around every other PC compatible in existance. Just one problem -- like the Sanyo, the Eagle people left out a buffer of video RAM, so Lotus 1-2-3 wouldn't "WHOOOOSH" through its menus properly. It has been years, I believe that your Eagle II is not an 8088 machine. I think that it is the 80186 machine that I described. Look under the hood -- is it an 8088 machine? Is it larger than a standard IBM-PC? The keyboard looks oversized. There was another Eagle machine, their last, a luggable called the Spirit, a very slow 8088 machine that can be considered a Compaq clone. I'm curious about Barbara Hendryson's Eagle PC. What year was it built? What was the manufacturer? Know any more about the Eagle PC or Eagle Computers, Inc., contact us!